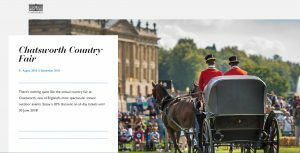 The Chatsworth Country Fair is one of England’s most spectacular annual outdoor events. Held in the park, it attracts visitors from all over the country. The Chatsworth Country Fair is a truly memorable event for all the family, with all the fun of the vintage fairground for the young and young at heart so come and join us for a feast of entertainment with live demonstrations.